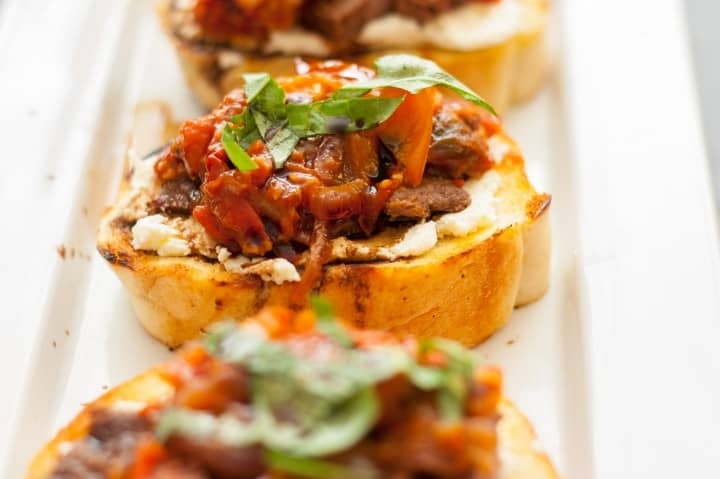 Steak Bruschetta on toasted french bread with a goat cheese spread, tomato onion jam, and thin skirt steak. Topped with balsamic vinegar and fresh basil. I’m all for decadent recipes that are simple enough to cook, and make you look like superstar chef in the process. 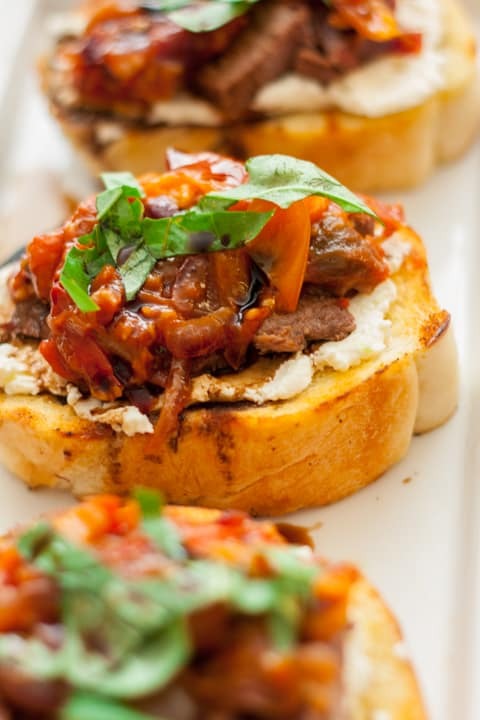 This Steak Bruschetta with Creamy Goat Cheese and Tomato Jam will do just that. 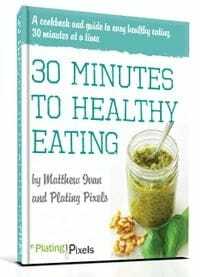 That goal of this blog is to help you become a better cook. 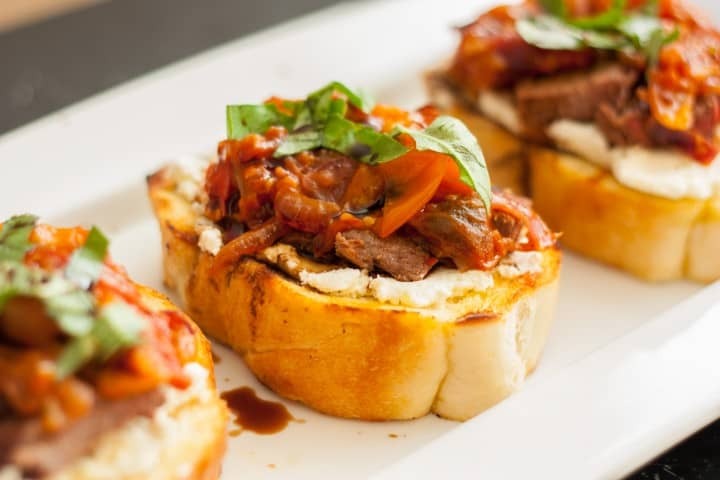 This is where this Steak Bruschetta recipe comes into play. Try it out and you’ll be amazed at the quality of cooking you can accomplish; all with common ingredients and cooking techniques. 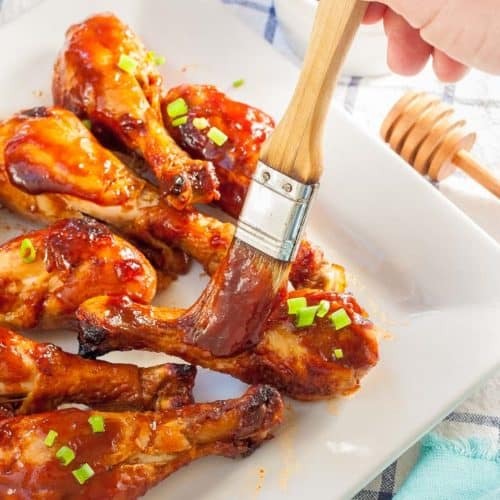 This recipe is a little more special and includes an easy jam that is derived from cooking down onions and tomatoes until they create a sauce-like spread. This creates a rich, flavorful jam that tops this elegant recipe. The base consists of toasted french bread slices, topped with a goat cheese spread and thin skirt steak. The spread is creamy, powerful, and has a garlic kick to it. Top with balsamic vinegar and optional fresh basil and you have a bruschetta recipe like no other. Cook beef to an internal temperature of 145º F for medium-rare, 160º for medium, and 170º for well done. Let rest for at least 5 minutes before slicing to hold in moisture and ensure tender, juicy steaks. Pro tip: Slow cooking the onions on low heat softens them enough to merge into a tomato jam, while not burning. Note: I prefer barbecue the bread and steak for added flavor, but to make the recipe more accessible I’ve included instructions in the broiler. To barbecue bread: Place slices over medium-high heat grill, flipping after a few minutes, until slightly toasted on both sides. To barbecue steak: Grill at medium-high heat for 3–5 minutes. Rotate and cook 3–5 minutes more, until browned and cooked to desired doneness. 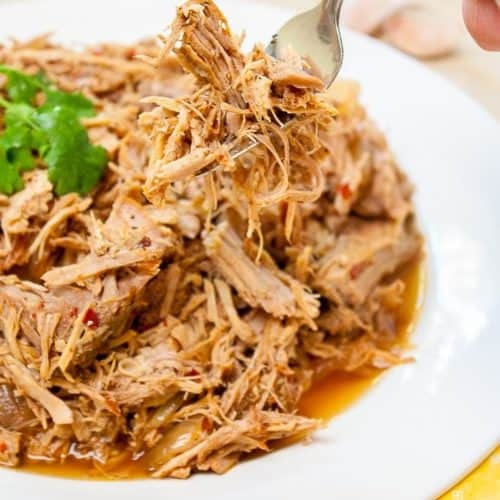 This recipe is a little more special, and includes a quick and easy jam that is derived from cooking down onions and tomatoes until they create a sauce like spread. This creates a rich, flavorful jam that tops this elegant recipe. The base consists of toasted french bread slices, topped with a goat cheese spread and thin skirt steak. The spread is creamy, powerful, and has a garlic kick to it. Top with balsamic vinegar and fresh basil and you have a bruschetta recipe like no other. 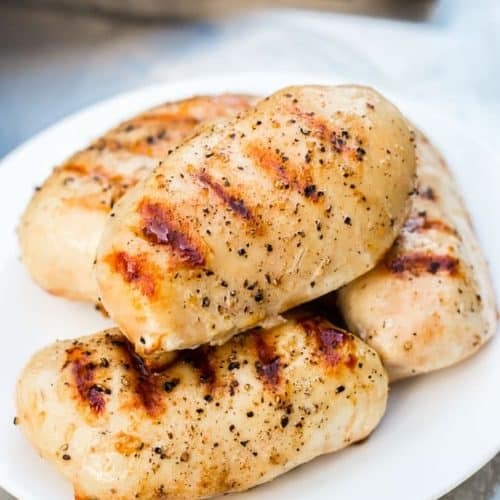 Preheat oven to 400º F. Heat 2 tablespoons olive oil in large skillet or non-stick pan to medium high heat. Add onions and cook until slightly softened, 3-5 minutes. Reduce heat to medium low and cook 20 minutes or until golden brown and very soft, stirring occasionally. Meanwhile, place tomatoes in a baking pan. Add 1 tablespoon olive oil, ¼ teaspoon salt and 1/8 teaspoon pepper, stir to coat. Bake at 400º F for 12-15 minutes or until soft. Remove and mash tomatoes, stir into cooked onions and remove from heat. In a small bowl, mix cream cheese, goat cheese, garlic, ¼ teaspoon salt and 1/8 teaspoon pepper until combined, set aside. Turn oven on regular to high broil. Sprinkle steaks with salt and pepper to taste (optional). Place in oven, 5-6 inches from heat. Broil 5-10 minutes, flipping halfway until browned, slightly firm and cooked to desired doneness. Remove steaks, allow to sit 5 minutes, then cut into ½ inch pieces. Coat both sides of sliced bread with remaining olive oil. Broil bread 3-5 minutes until toasted. Spread cheese mixture onto toast, top with steak, then tomato jam. Top with fresh basil and a drizzle of balsamic vinegar. This is one of the best bruschetta recipes I’ve seen! love the jam that goes with the steak! That’s such a nice compliment! Thanks Anita! I’ll take two please! YUM! Why not take the whole batch? Thanks Brandon! Love all the delicious layers…yep and few of these and dinners done! Thanks Marjory! I could eat at least a few of these! Now that’s an appetizer – and I love that gif! Thanks Steph! I do those sometimes when I feel it helps the recipe. Glad you liked it! Sounds like the perfect summertime appetizer! Thanks Cynthia! I could enjoy this year round. I few of these and you won’t need an entree! Love the goat cheese in these! You could totally do this as an entree. I did that when I made these. Thanks Christina! I love a good crostini and that tomato jam looks great! That tomato jam really makes this! Yum! It totally does. Thanks Megan! Now that’s my kind of bruschetta, yummy!! Love the combination of the goat cheese and tomato jam! Oh wow! I have some tomato jam sitting in the back of my fridge. I keep wanting to do some kind of appetizer with it. This looks like a great appetizer! Thanks Christine! If you have some tomato jam pre-made or bought that would definitely work too. If you want to keep this a simple appetizer (or vegetarian friendly) you could omit the steak.